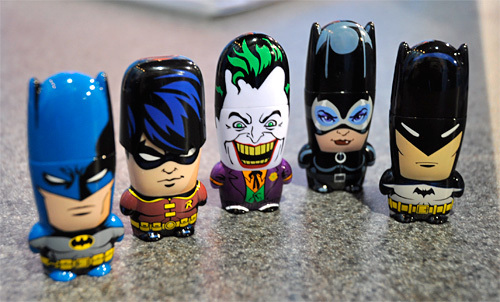 Mimoco Adds DC Comics Characters To Their MIMOBOT Line, Starting With Batman | OhGizmo! By Andrew Liszewski on 01/10/11 • Leave a comment! As they pointed out to me when I stopped by their booth at CES on the weekend, Mimoco’s MIMOBOT flash drives are a subtle way to express your real self at work, particularly if you happen to be a geek stuck in a world of suits and ties. To date the company’s biggest franchise has been their Star Wars themed USB flash drives, but at CES they announced their latest licensing agreement which now brings characters from the DC Comics world into their fold. First up is a limited edition 5,000 piece run of a vintage 1939-era Batman to be followed by other characters come February including a more recent Batman, Robin, The Joker and Catwoman. And further down the line we’ll be seeing characters from other DC Comics’ franchises get the flash drive treatment like the Green Lantern, Superman and The Flash. And as with previous versions, the drives range in size from 2GB to 16GB and include pre-loaded character specific content like wallpapers and screensavers.